A grand Dacning Couple Ercolano Musical Jewelry Box with a spectacular natural wooden finish. 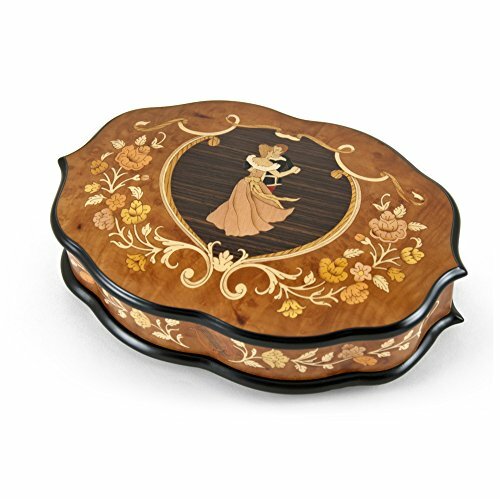 A gorgeous, beautiful and one of a kind Couple inlay is displayed. This musical beauty also features an all around Floral inlay that is unimaginable. This is a prestige and popular rosewood finish musical jewelry box, made in Sorrento Italy by the most talented craftsman from around the world. The interior is in lined with soft velvet that will preciously hold your jewels in comfort. Within the box you can hear the 18 note Swiss made flawless musical movement. Please choose from the large list below, if there something that you need that you don't see, please email us at any time!! Lenght - 10"; Width - 6.5"; Height - 2.75"
A grand Dacning Couple Ercolano Musical Jewelry Box with a spectacular natural wooden finish. This musical beauty also features an all around Floral inlay that is unimaginable. This is a prestige and popular rosewood finish musical jewelry box, made in Sorrento Italy by the most talented craftsman from around the world. The interior is in lined with soft velvet that will preciously hold your jewels in comfort.